Simply counting executive orders, pages, or words can produce misleading statistics. In legal language, at least, the frequency with which restrictions occur can serve as a proxy for measuring the overall restrictiveness of text. Content matters. President Obama recently ordered executive branch agencies to pay a minimum wage of $10.10 per hour to federal contractors and subcontractors. The Department of Labor finalized a rule implementing the president’s directive in early October. These actions reflect one way that American presidents formally wield executive branch authority: by issuing executive orders and proclamations. The current administration has highlighted its own willingness to use executive orders and all other “existing legal authorities” to implement desired policies, first in this year’s State of the Union Address and later in press briefings. In response, some analysts pointed out that the number of executive orders issued by presidents has been declining over the 20th century and that President Obama has issued fewer executive orders than many other modern presidents. In his first term, for example, President Obama issued 147 executive orders, compared to 173 in the first George W. Bush term, 200 in the first Bill Clinton term, and 166 for George H. W. Bush’s only term. While other analysts have examined the number of executive orders issued by different administrations, we have used RegData, a database producing statistics based on the Code of Federal Regulations, to examine some of the content of these executive orders and proclamations for the past six presidencies, through the end of Obama’s first term. 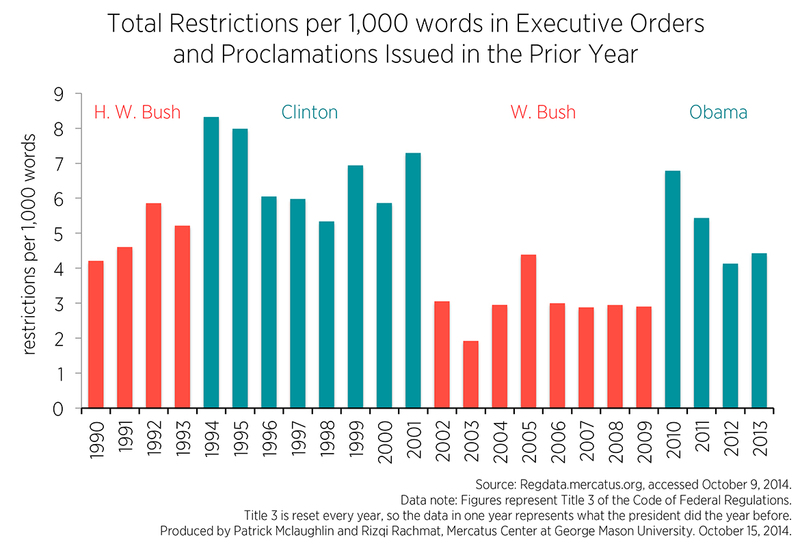 In particular, we examine the usage of restrictions—words that create binding, legal obligations, such as “shall” and “must.” Although the current administration has issued fewer executive orders than other modern administrations, the figures below show that its total usage of restrictions in executive orders and proclamations exceeds that of any of the past six administrations, with the exception of Clinton’s first term. 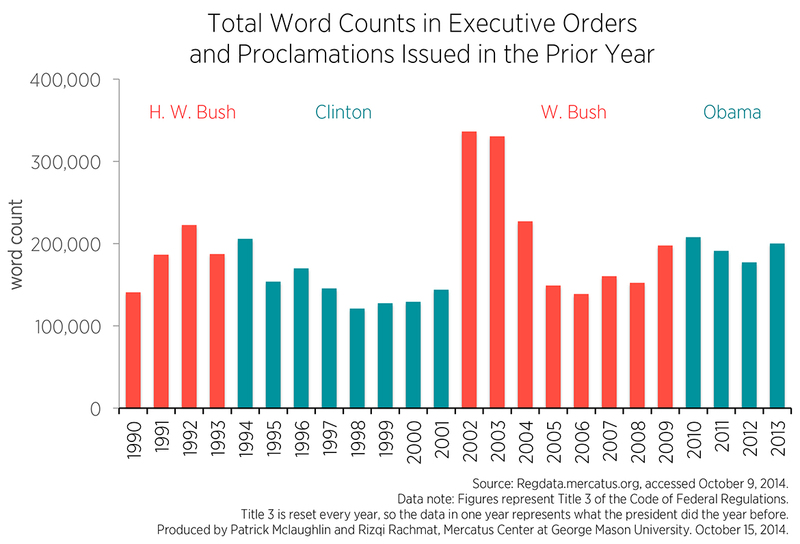 In fact, while the figures below show that Obama’s first term hardly stands out from other presidents with regard to the number of words published in executive orders and proclamations, both the Obama years and the Clinton years stand out for the restrictiveness of the text they produced, as measured by restrictions per 1,000 words. The charts below examine trends related to the quantity and content of executive orders and proclamations for the past six presidential terms by examining Title 3 of the Code of Federal Regulations. Title 3 of the Code of Federal Regulations contains all executive orders and proclamations published annually. (Title 3 also contains some regulatory language published by the Executive Office of the President regarding topics such as standards of conduct for White House employees, but this portion of Title 3 is relatively small compared to the compilation of the previous years executive orders and proclamations. For example, in 2012, it accounted for only 2.2 percent of the words in the entire title.) Unlike elsewhere in the Code of Federal Regulations, Title 3 is reset every year—so if you look at Title 3 in one year, you will see the executive orders and proclamations the president issued in the previous year. The first figure shows the number of restrictions published in Title 3 in each year from 1990 to 2012 (the full range of years for which we have data). The data shown in the chart correspond to the number contained in executive orders and proclamations issued in the prior year. Thus, the number of restrictions shown in year 2010 reflects the restrictions from executive orders and proclamations from Obama’s first year in office, 2009. The number of restrictions shown for year 2006 reflects the first year of George W. Bush’s second term, 2005. Figure 1 examines restrictions from Title 3 for the past six presidential terms. The presidential terms included are George H. W. Bush; Bill Clinton I; Bill Clinton II; George W. Bush I; George W. Bush II; and Barack Obama I. This figure shows a couple noteworthy patterns. 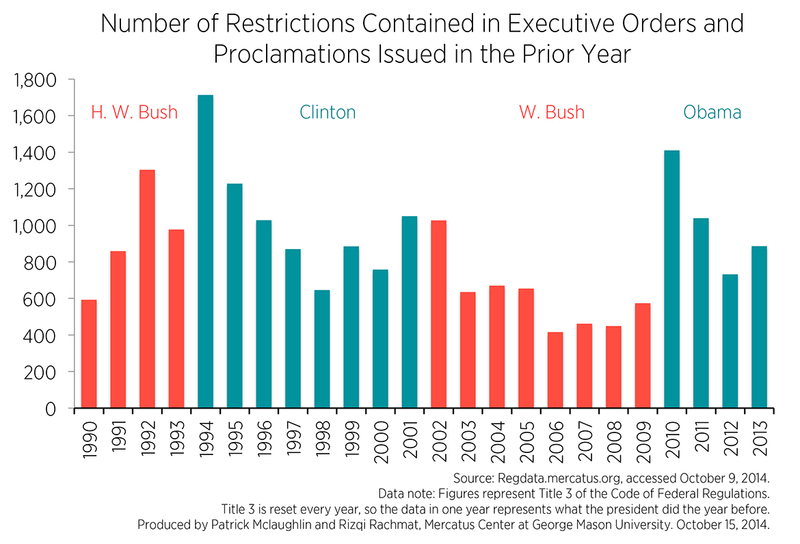 First, with the exception of George H. W. Bush, a new president tends to issue the most restrictions in executive orders and proclamations in his first year. It’s plausible that this only occurs after a new president is of a different party than his predecessor, as the incoming president takes actions to repeal the previous president’s policies. This would also explain why George H. W. Bush’s first year did not show a relative surge, since he was taking over from a fellow Republican (for whom he had also served as vice president). Second, while the number of executive orders issued during Obama’s first term may be smaller than many other modern presidents’, the number of restrictions contained in those orders and proclamations appears to exceed the numbers issued by other modern presidents. This pattern also stands out when we examine the cumulative number of restrictions for each of the six presidential terms. 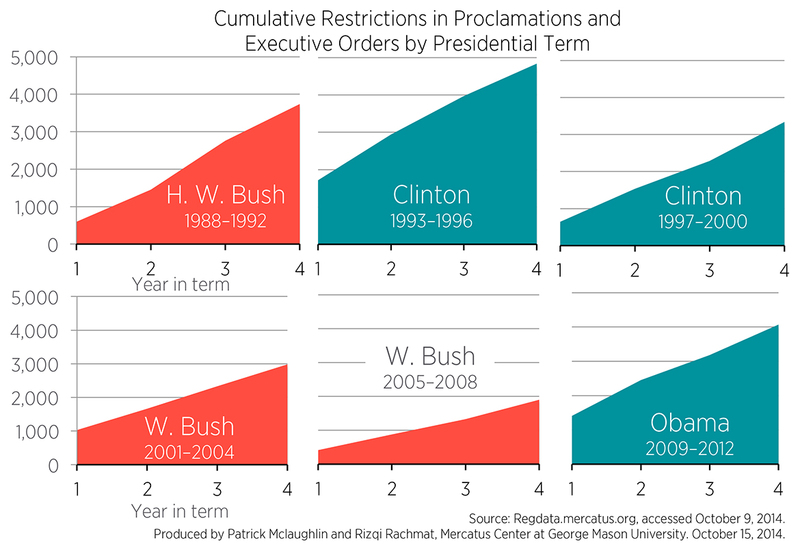 Figure 2 illustrates this, where the figure shows the term’s cumulated total of restrictions from executive order and proclamation. Figure 2 shows that Clinton’s first term accumulated the most, followed by Obama’s first terms. It also shows a stark contrast between W. Bush’s second term and Obama’s first term. All of the figures above examine only the total number of restrictions issued—an easy variable to examine since RegData measures restrictions by year. In addition to restrictions, RegData also measures the total word count of Title 3 in each year. Word counts paint a different picture compared to restriction counts. An examination of word counts shows similar results as an examination of the number of executive orders published. While George W. Bush issued by far the fewest restrictions in his two terms, he also issued the largest quantity of words (at least in his first term). Similarly, in terms of word counts, the first Obama term and the first Clinton term appear to be typical for modern presidents. Figure 3 shows this. However, as noted above, not all executive orders are created equal. The contrasting results from analyzing word counts and restriction counts illustrate an important distinction in legal texts. Executive orders and proclamations do not have to contain restrictions. For example, Obama’s executive order 13563, which is directed at executive branch agencies on the topic of regulatory review, contains 17 occurrences of the restriction “shall” and 3 occurrences of its less obligatory cousin, “should.” In contrast, executive order 13579 is directed at independent agencies and contains only 4 occurrences of the restriction “shall” but 8 occurrences of the strong suggestion “should.” This contrast demonstrates that the actual content of text matters. Executive orders can be used to provide information or suggestions, or they can be used to create constraints on actions sets in a way that is similar to regulation. Restrictions create binding, legal constraints, whereas suggestions may not. Our final figure examines the restrictiveness of executive orders and proclamations. We do this by calculating restrictions per thousand words. Restrictions per thousand words are shown in figure 4. Figure 4 suggests a pattern that was not previously discernible: that some presidents may tend to use more restrictive language in their executive orders and proclamations. While the first Obama term and the first Clinton term appear typical when examining word counts alone, they appear atypical when examining restrictiveness.